I actually got out to see two movies in a theatre in January and it would be difficult to find a pair more incongruous than Paul King’s Paddington and Paul Thomas Anderson’s Inherent Vice, but I enjoyed them both more than anything else I’ve seen in a while. Paddington is based on a long-running series of children’s books by Michael Bond, the first of which was published when I was four years old. It seems, then, that I’ve been aware of his existence pretty much my whole life, though I probably read only a couple of the books. In many of its details, King’s adaptation sticks close to the source; where it deviates most is in the imposition of a villain and a big action finale which seem more inspired by the perceived needs of a big-screen family movie than by Bond’s original tales. This aspect gives the movie a slightly American flavour which is at odds with the domestic charm of everything else – but, I hasten to add, it did little to diminish my enjoyment. We’re so used to seeing actors interacting with CG characters by now that it’s easy to take the effect for granted, but the people who have breathed life into the small bear from “darkest Peru” have imbued him with a remarkable degree of personality. The heart of the film lies in the effect Paddington has on the members of the Brown household – overly cautious dad Henry (Hugh Bonneville), perky, tolerant mum Mary (Sally Hawkins), and kids Judy (Madeleine Harris) and Jonathan (Samuel Joslin). Needless to say, lessons are learned, minds are changed and rifts healed, but all without sanctimony and with a refreshing lightness of touch. As ordinary everyday events are now deemed insufficiently exciting, writer-director King adds in a murderously mean museum taxidermist (Nicole Kidman) who wants to mount Paddington in an exhibit because of events in her own unhappy childhood. Perhaps wishing to avoid sentimentality, King offers this character no personal redemption through her encounter with the bear and this small lack of empathy gives the film its one slightly sour note … but that’s a minor complaint given how good everything else is. 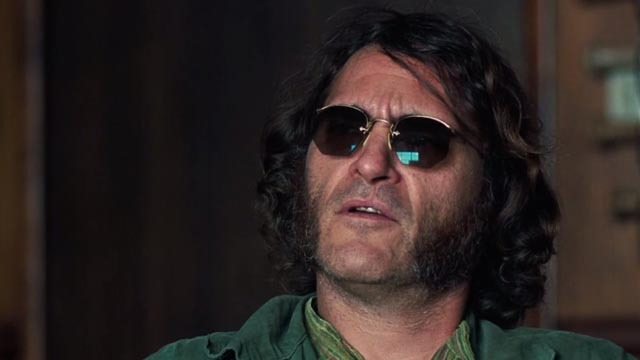 I made a point of catching Inherent Vice in a theatre because I had avoided seeing Paul Thomas Anderson’s previous film, The Master, on a big screen only to regret the omission after watching it on Blu-ray. The new film is not as visually stunning as its predecessor, but this is deliberate. Anderson and cinematographer Robert Elswit (who has shot all of Anderson’s films except for The Master) have given the new movie a deliberately rougher look, emulating film stocks and lighting from the early ’70s (along with that period’s hair and fashions). Adapted from a Thomas Pynchon novel (his work is generally regarded as unfilmable), Inherent Vice is almost impossibly convoluted – when it was over, I had a vague sense that all the parts do in fact fit together, but it’ll take further viewings to confirm this; however, this murkiness and seeming impenetrability is integral to the film. It takes place at that moment when all certainty seemed to disappear from American political and social experience (the late stages of the Vietnam war and the disintegration of the Nixon presidency); there is no bedrock of knowable fact, only impressions, suspicions and a paranoid sense of vulnerability. I’ve seen some references which compare the film to a cross between Chinatown and The Big Lebowski, but what sprang to mind as I was watching it was Robert Altman’s The Long Goodbye, with its dazed, laid-back detective drifting through events whose sense never quite comes into focus, although the character manages to remain the narrative’s moral centre. Built around Joaquin Phoenix’s stoned innocence as Larry “Doc” Sportello, the film plays as a collection of episodes involving various missing people and shady land deals, each scene loaded with comic detail and surprising emotional resonance. I honestly didn’t care that I couldn’t follow the storyline because each moment was so entertaining in itself. The city of Los Angeles is essential to both The Long Goodbye and Inherent Vice; the place shapes the characters’ lives through its own clear lack of definition – sprawling, shapeless, a seemingly random collection of elements which embody social divisions and open up spaces where corruption, ennui and despair can flourish. 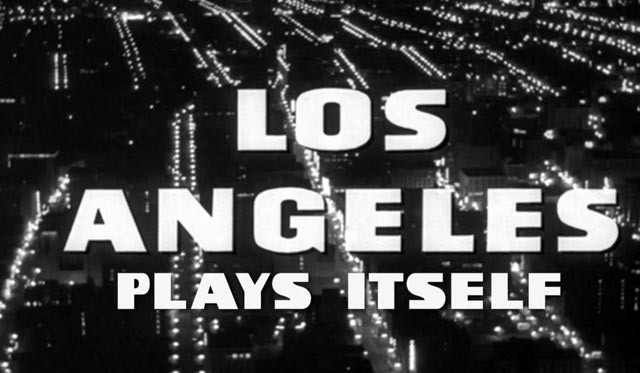 The nature of Los Angeles as both a real place and a mythological space endlessly represented and redefined in the movies is the subject of Thom Andersen’s Los Angeles Plays Itself, one of the greatest essay films ever made. The power of Los Angeles Plays Itself lies first in the dynamic way it demonstrates how the movies have shaped our perception of our world, and second in the way Andersen bends this back on itself to force us to begin seeing the actual world – a feat accomplished ironically by moving from mainstream movie clips to “outsider” movies, the more raw, documentary-like probing of the non-glamorous social reality of “ordinary” people in films like Kent MacKenzie’s The Exiles (1961, a movie rediscovered largely because of Andersen’s use of it here), Charles Burnett’s Killer of Sheep (1978), Haile Gerima’s Bush Mama (1979) and Billy Woodberry’s Bless Their Little Hearts (1984) … in effect countering the sheer weight of Hollywood’s mythologizing by refocusing on members of the struggling underclass. If there seems to be a danger of positing an authenticity of the poor versus the unreality of the rich, that’s not what comes through in the final moments of Los Angeles Plays Itself; rather Andersen manages to make the viewer see the city as a physical and social space rather than as a constructed fantasy. To a large degree he succeeds in reclaiming his adopted town from the industry which has transformed it into that fantasy, and he has done it, ironically, by using the very images which that industry has served up for over a hundred years. This entry was posted in Commentary, Review and tagged Animation, Blu-Ray, Directors, Documentary. Bookmark the permalink.